Band Of Outlaws joined the strong team of smart juvenile jumpers from the Joseph O’Brien stable by coming from last to first to claim the EMS Copiers Rated Novice Hurdle at Naas. O’Brien has the ante-post favourite for the Triumph Hurdle in Sir Erec, and Band Of Outlaws staked his claim for Cheltenham by showing a decisive turn of foot to come out on top in a slowly-run race. Delivered with a well-timed bid by JJ Slevin, Band Of Outlaws (5-2) drew away from long-time leader Maze Runner after the final flight to win by four and three-quarter lengths. “I’d say the race suited him as they went slow. He was a seven-furlong horse or miler on the Flat, it turned into a bit of a sprint and that probably suited the quickest horse in the race,” said O’Brien. “He might be one to stay at home. I don’t know if he’d be one for the Triumph or not. O’Brien admitted being disappointed with his other runner, Konitho, who was only fifth of the six despite being sent off the 11-10 favourite. “You’d have to say he was a little bit disappointing. The race probably didn’t suit him as he’s a bigger, more of a staying-type of horse,” said the trainer. O’Brien completed a double when Eviscerating (10-1) had his head down at the right time to pip Coral Blue by a nose in the Adare Manor Opportunity Handicap Hurdle in the hands of Evan Daly. O’Brien said: “Evan gave him a good ride. I thought he was beat, but when we saw the replay, I was standing with Eddie (O’Leary, racing manager for owners Gigginstown House Stud) and his head was down at the line so we thought he had a little chance because he hit the line well. Roaring Bull (7-1), also owned by Gigginstown, asserted from the final fence under Jack Kennedy to storm to victory by 14 lengths in the O’Driscoll O’Neil Handicap Chase. 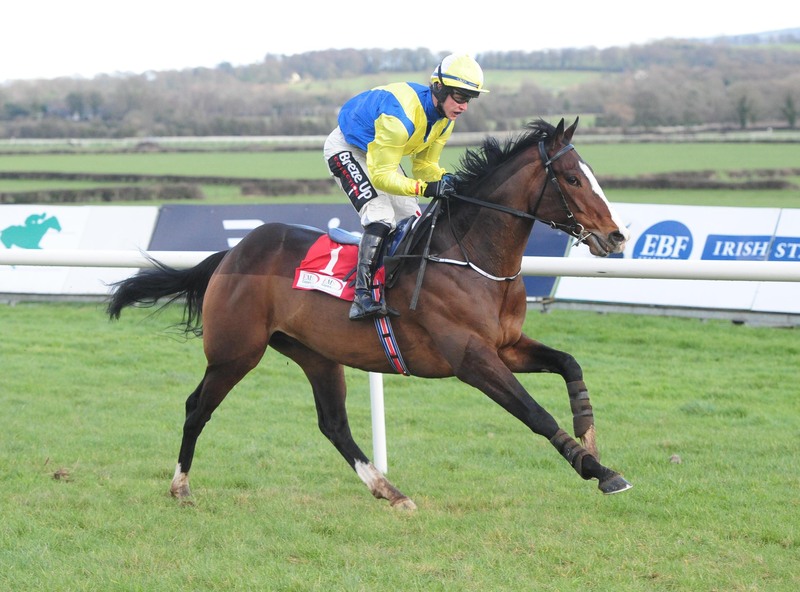 Top-weight Velocity Boy gallantly tried to lead all the way, but had no answer to Gordon Elliott’s charge in the closing stages. “I thought it was going to be a tough day and I thought we might struggle for a winner,” said Elliott. Barnes Des Mottes (4-1) won a dramatic race for the Jordan’s Centra (Pro/Am) INH Flat Race in which there was a three-horse pile-up. Finian Maguire got home by four lengths on Liz Doyle’s four-year-old from 66-1 outsider No Grey Area’s. Little Lady Lou fell on the home turn, bringing down the 6-4 favourite Front View and My Uncas. All horses and riders got up and appeared to escape serious injury. Doyle said of her winner: “He’s a real man of a horse.